For the simulations daily and weekly load variations for the DHW with hourly resolution were created in order to separate between the ambient temperature dependant SH and independently varying DHW loads. To achieve realistic load profiles, they were created based on measurements from operational plants. Measured hourly load data was obtained from six plants of various sizes. Measured monthly total loads were obtained from 18 plants of various sizes. It was found that the studied load profiles are basically of the same shape, i. e. mostly SH with a comparatively small summer loads (DHW and partly or mostly distribution losses), lower than 15% of peak load. A. Troi*, Y. Vougiouklakis2, E. Korma2, D. Jahnig3, E. Wiemken4, G. Franchini5, D.
Fig.4 shows the hydraulic schemes of the old and the new heating system with the heat meters which are red marked and named “Fdxx” and listed in Table 1. A closer look on the results of dimensioning the base case leads to a comprehensive knowledge about the MaxLean system behaviour and the advantages of the concept. To gain insight into the influence the components have on the optimised system, a number of parameter variations were performed. For each variation a new optimisation procedure was carried out leading to different curves in the cost/savings diagram. Figure 3 gives an overview of the parameters varied and the results of the optimisation runs. There are several possible ways to connect a solar thermal plant to a DH network, with no proven general optimal system layout. 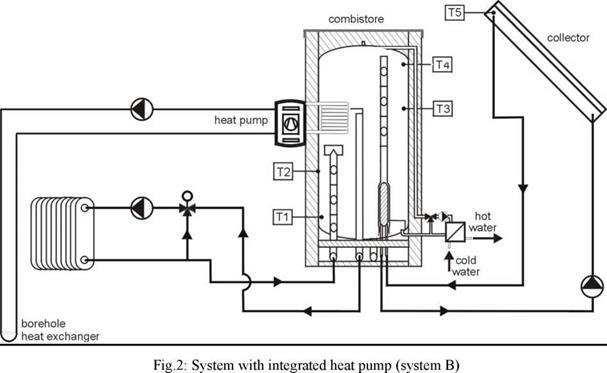 The chosen system design principle is shown in fig 2., where the storage tank is connected in parallel with boilers. The control system keeps the outlet temperature from the collector array always above the required DH supply temperature by varying the collector loop mass flow rate. This control strategy is needed, if one wants to be able to completely turn off the boilers for a period during summer.